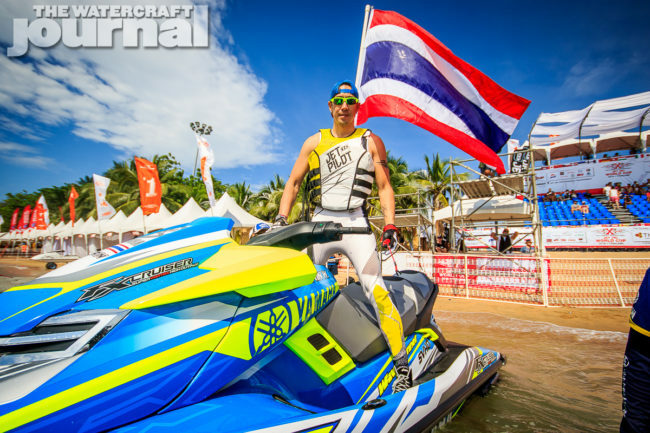 Elevating The Sport: How To Become a Truly Professional Racer | The Watercraft Journal | the best resource for JetSki, WaveRunner, and SeaDoo enthusiasts and most popular Personal WaterCraft site in the world! Let us begin by saying that what has been published here is neither a reprimand or adjudication against any one person or even the whole of the racing body. 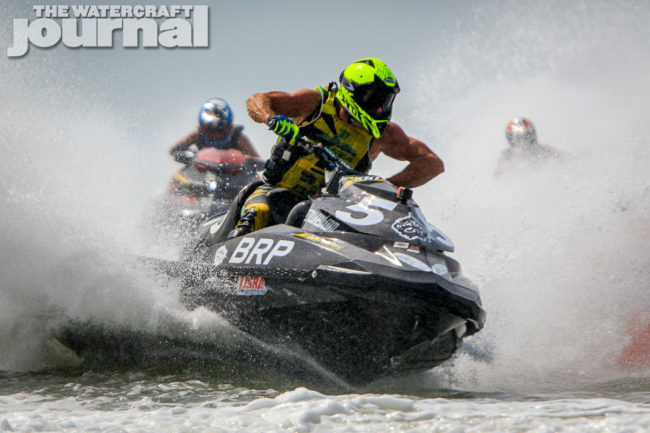 We can all agree that professional PWC racing is nowhere near what it could be, what it used to be, or proceeding in a trajectory of where it ought to go. Blame, being justified or not, is easily dished out, but fails to actually provide solutions – and this article intends to provide realistic solutions to assist racers of all stripes in elevating the sport from the ground up. What is presented here is a near perfect outline of how to both satisfy current and secure future sponsorships, guarantee the most visibility through the existing media, and provide tips on how to do so either easily or most affordably. You will note that nothing in here will teach you how to be a better rider, build a faster watercraft or even become a skilled tuner. Talent, experience and education are the trades that have brought you thus far. What we are discussing here is making you in to a brand. If you are a “bootstrap racer” you need this article. If you are looking to make a career out of racing you need this article. Here we provide advice that might sound like “busy work” but is devised to elevate your racing efforts into a bankable and reliable brand that companies will want to support with both product and financing. It can be done if it’s done right. This is going to be a looong article, so to help break up the content therein, we’ve tried to segment the topics into easier-to-digest portions. The goal of this tutorial is not to make The Watercraft Journal look like a “know-it-all” or otherwise; rather, it is to convey an accumulation of knowledge accrued over years of observation, conversation with major entities in our sport, and an in-depth understanding of the nature of promotion, media relations and business “best practices” both here in our own industry and within far more lucrative motorsports. Every point, every suggestion is tailored for your success. Learn from the mistakes of some, and draw from the success of others, and together the whole of the industry can rise. Not all classes are created equal. In most cases, the class that matters most to the OEMs (Original Equipment Manufacturers) above all else is Stock. It always has been, it always will be. Why? Because manufacturers believe Stock class resonates to the consumer far more than other more heavily-modified classes. Make no mistake, the big OEs want to win in Stock class. To them, a win in Stock class means an increase in sales, and helping your sponsors sell more product is the name of the game. Regardless of the rider’s experience level (Pro, Amateur, Veteran, Senior, Junior, etc. 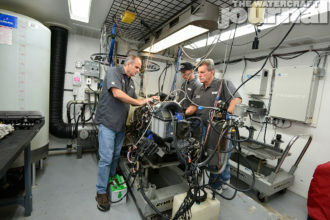 ), the closer the craft is to being “stock” the greater the appeal from the OEM. If you’re racing in a different class (Vintage, Sport, Runabout Open or GP, or most Ski classes), be prepared to take a different route. These classes can often have a high attrition rate, so the way for you to get the attention from a major sponsor’s marketing department is to be consistent. If you’re regularly on the podium, attend every single race in your series and complete every moto all without a single breakdown (especially in a competitive class), it is all but guaranteed that you’ll be not only an overall winner when the season is over, but likely compensated for your consistency. In the case of Yamaha, the company’s top priority is demonstrating the reliability of its products. A season without a single DNF definitely would mean a lot if Yamaha was your sponsor. But consistency requires two substantive sacrifices: preparation and patience. Too often racers postpone their prep and tuning until days or hours before the event, only to finish their moto at the end of a tow rope. There is no glory in this. 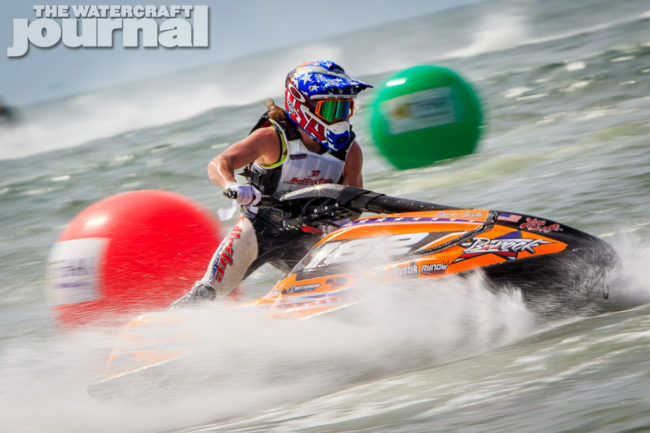 Being the fastest ski on the water for two laps means nothing if you cannot finish the race. Ergo, it requires a great deal of patience to build a combination that is not only competitive but reliable. Most speed fanatics lack the restraint in this area and come home with DNFs instead of podium finishes. Again, you might not have the fastest ski on the course, but you know you won’t break down – so you can race with confidence. Practice the art of preparation and patience and you’ll be rewarded. 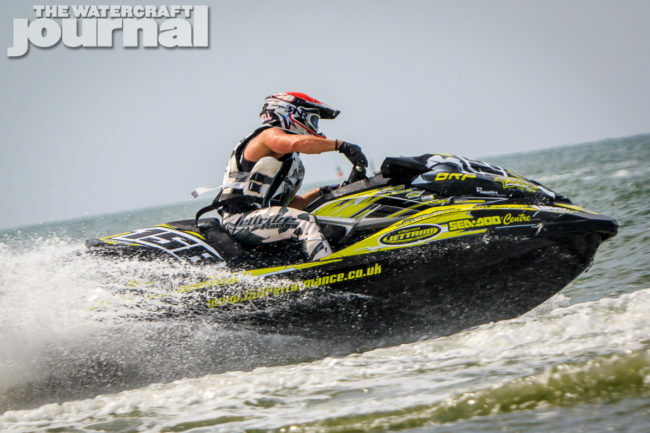 There are several reasons why the overall look of your PWC, riding gear, pit and trailer are important to your success as a professional racer: First, you want to look like you’re better funded than you actually are. This gives you an edge of intimidation over your competition who will think you’re better equipped than you might actually be. Japanese samurai, and Apache and Commanche Indians all knew the value in intimidation, be it through facepaint, banners, battle cries or otherwise. Having a professional-looking pit, trailer, tent, ski, suit and helmet (all color-coordinated) not only represents yourself well, but makes you look more well-funded, organized and better-equipped than they might feel about themselves. Second, you want to look professional, in fact, more professional than those whom you’ll be competing against. If your goal is to acquire the utmost in sponsorship support (be it through actual dollars and/or product support), you need for your sponsors to feel like their money is being spent appropriately. You want to look like a solid investment. Even if you’re just starting out, put some money aside to make yourself and your equipment look presentable. You are literally dressing for the job you want, so look accordingly. A clean pit area, organized workbench, well-maintained PWC and a well-groomed rider speaks volumes to a would-be sponsor. Sponsors are regularly found touring the pits and can quickly evaluate whether a racer would be a good representative of their brand (or not) with a quick review of their pit. Next, you want to look photogenic. You yourself, your pit and your ski all want to look gorgeous on camera so that your sponsors, the promoters and the media all want to republish images of you everywhere possible. Being photogenic means there will be hundreds of photos of you swirling around in the social media-sphere, and these outlets are far more likely to use you in promotional material, news articles, Facebook posts, etc. if you photograph well. Remember, the idea is to represent your sponsors through exposure, and being photogenic is the easiest way to ensure future support. While many spectators might not be able to name any one specific racer, it is supremely easy to recall a specific color combination and race number when cleanly and clearly presented. Many famous racers have a very iconic, very memorable color package (Richard Petty, Dale Earnhardt, etc.). Please know that monochromatic (all black, gray, white) paint schemes don’t photograph well, nor do very complicated wraps or paint jobs. Thus far, Europeans have mastered this art far better than most Americans. 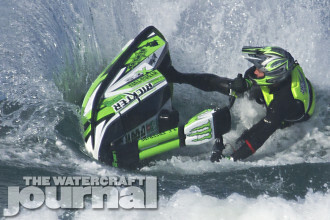 Few American graphic companies offer complete wraps or wield the graphic design skill to develop a unique look that compliments the contours of the PWC and create an attractive design. Remember, “busy” designs can be worse than no wrap at all. Equally, a race number is just as important; we’ve talked with a few companies who all said that “69” is inappropriate and would never be allowed for use in their ad material (so was “666”, “007” or even iconic The Dukes of Hazzard “01”). In selecting a number, we suggest a non-prime number and one that rolls off the tongue. Erratic numbers like “397” aren’t immediately memorable and can look jumbled. And don’t use already established numbers like “43,” “23” or “32” – you don’t want the comparison or to look like a parody. Remember, your goal is for companies to want to share your picture. Make it easy for them. Find a color and number combination that you can keep throughout your whole career. Trailer: If you are able to afford one, the best rigs consist of an enclosed trailer that has been wrapped in a custom wrap with an image of the racer at either a 3/4 or profile shot, and the racer’s name and race number (with the logos of the racer’s sponsors) in large, color-coordinated font. Wraps can be expensive, we know, but are well worth the investment. It might be worth exploring pursuing a graphics company as a sponsor to either provide or heavily discount your wraps. EZ-UP: Color-matched to the trailer, ski and rider’s gear with either the racer’s name or biggest sponsor printed on the canvas. Often a labeled EZ-UP can be provided through one of your existing sponsors. If not, they are available for purchase nearly everywhere. If you do happen to purchase your own, print your race number on top and sponsors on the sides. You can also sell spaces on your EZ-UP to sponsors if you have a blank one. You’ve got real estate to sell ad space. Use it wisely. 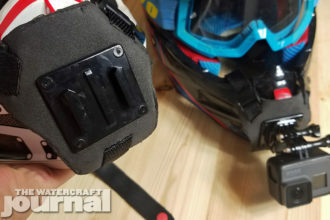 Suit & Helmet: Here’s the problem; many riding gear manufacturers supply free product, but their selection is limited. They might offer vests, wetsuits and gloves, but no helmets. Or vice versa. This is where you need to be political. Secure a sponsor for riding gear first as you’ll be wearing that out faster than anything else. Your suit, gloves, vest and boots need to compliment the graphic design and/or color combination of your ski. Next, pursue a sponsor for a helmet (and goggles). If a deal cannot be made, find one you like and have it painted to match your ski and emblazoned with your race number. You want it visible from the tower. No matter the combination you want one that will really pop on camera. PWC: This portion is imperative. Too often a racer merely slaps on some die-cut decals and calls it a day. This not only looks sloppy, but is often a source of embarrassment for many sponsors. So often racers place little pride in how their PWC look and marvel as to why their images are never shown in magazines or media. 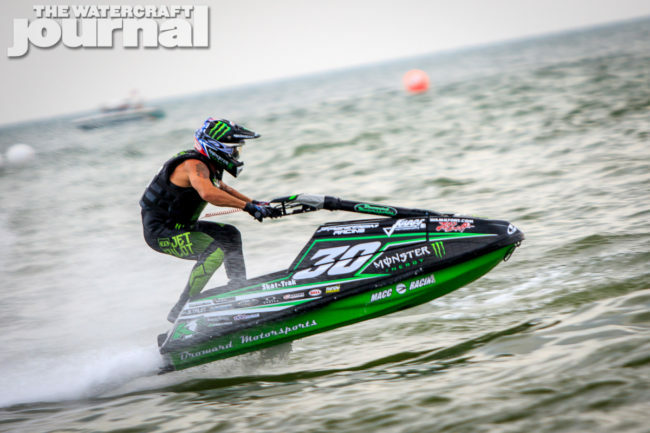 The best example of this is Gyorgy Kasza’s all-carbon fiber RXP-X. 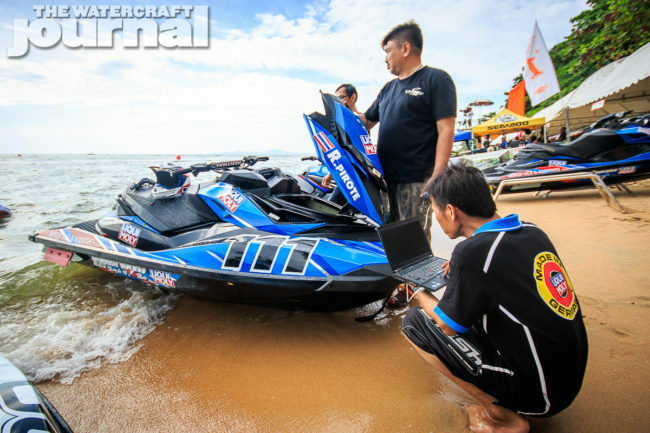 Despite being the fastest Sea-Doo on the water, it’s an aesthetic nightmare of muted blacks and missing panels. It’s all but impossible to make out what it even is, and will never be used in official Sea-Doo advertising. Wraps and decal kits are superior to a custom paint job for a couple reasons. First of course, is expense. A custom paint job can be extraordinarily costly. Second is repair. Unlike a modular wrap that can have portions peeled off and replaced, a damaged paint job needs to be sanded down, primed, repainted, blended and buffed. Equally, a wrap can be applied to a new watercraft if you switch model years. Plus, today’s wraps are so extensive, you can literally hide all traces of the original gel coat, allowing you a virtual blank canvas to design your look and sponsor layout. Bright colors separate you and your watercraft from the water. Wraps and colorful designs add personality. All too often American racers neglect this single step. Internationally, many sanctioning bodies literally require this level of aesthetic professionalism or will refuse the racer’s entry. 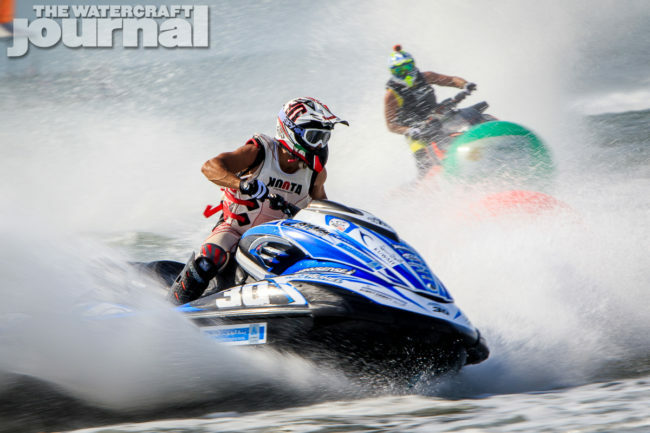 Helmets, riding gear and watercraft all need to meet these specific levels of visual value in order for the promoter to retain its media contracts. If the skis on the water are as attractive as the venue, the media coverage will come. This is a proven fact. At no point has exposure to a massive audience been more readily accessible. 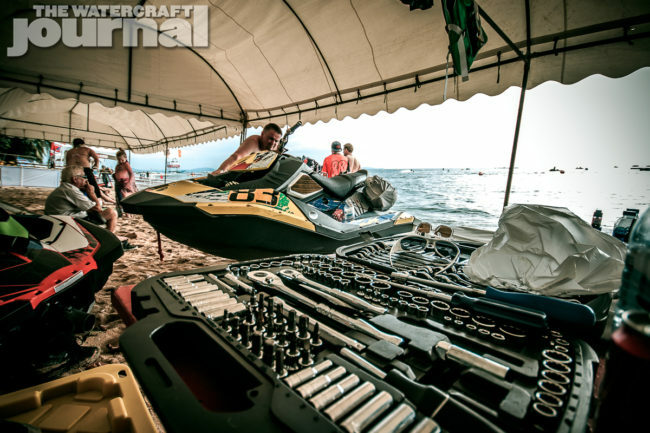 Although The Watercraft Journal is the single-largest PWC media outlet in our industry, we’re not the only resource there is. Each of your sponsors has their own social media accounts, and you want them to share your images and information too. Exposure puts your name on people’s lips, making you a brand, and this, in turn, elevates the value of your brand. Photography: You need constant photography documenting your efforts. It might be worth having a spouse, relative or friend on-hand snapping candid shots of you at all times, as if you were living in a reality show. You also need race same day photography, both in the pits and on the water. This might mean making deals or arrangements with professional photographers at the event. These images are vital to your success, as they can be used and shared on social media, with magazines and sponsors. Press releases: All professional race teams issue regular press releases announcing tour schedules, sponsorship deals or other sponsorship agreements. Also, they always send out a brief but detailed recap of every race weekend the night of, or the next day. This recap is emailed to every sponsor and every media outlet possible. It should be two paragraphs long, documenting the what, where, how and why’s of your most recent race. If you fail to do everything else on this list, make sure you do this one thing. Kevin Reiterer and Mark Gomez never miss a beat to do this. And their reward is constant media attention. It’s imperative to the future of your career as a professional racer. Decal placement: Obviously, the most visible spots are the most valuable, so make sure that they are priced accordingly. 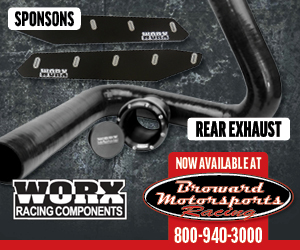 For runabouts, we suggest keeping the factory-looking billboard on the side (below the bond line) and selling that to your biggest sponsor (typically it’s the PWC manufacturer), placing large decals on the front deck, and all of your smaller sponsors in a same-colored sequence down the hood with your race numbers large, unbroken and clearly visible. These same logos can run either up the upper fairing or along the rear deck too. You want to sell logo sizing to sponsors who aren’t big sponsors already. Again, you’re selling valuable real estate for ad space. You are a rolling billboard. Think accordingly. Hats/shirts/decals: Admittedly, this is a particularly sore subject with several sponsors of current racers. It is imperative that you wear your sponsors’ swag (hats, T-shirts, etc.) in the pits, on the beach, and definitely on the podium – or any other time when photographed. On the podium, Chris MacClugage is never without a can of Monster and/or his helmet, which has all of his sponsors on it. AquaX makes this hard with their jerseys, so wear a baseball cap with your title sponsor’s logo. This exposure is what they’re paying/sponsoring you for. Make it part of your pitch in the future. Your sponsors will supply you with swag to represent them if you ask. Also, consider asking for a stack of stickers that you can give away at your pit. Have a folding table with a stack of free decals from all your sponsors that you can hand out. It’s another offering you can present to get some added sponsorship money. As a final note, don’t expect anyone to do these things for you. If you want media coverage, you need to make the media’s job incredibly easy. The easier you make their job, the more coverage you are going to get. This is a rock solid fact. The same goes for sponsorship. The easier you are to support (by being a good sport, acting professional on and off the water, maintaining a professional-looking pit area, PWC and equipment) the more likely you are to receive positive responses to companies that you petition for sponsorship. 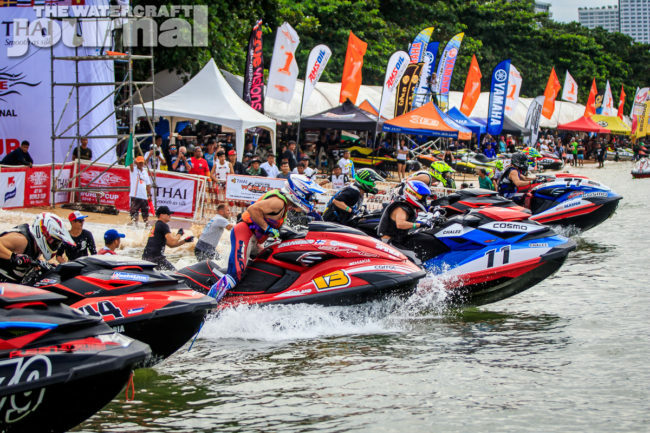 Do not wait for Budweiser to suddenly come back and sponsor the IJSBA World Finals, or for a new race director to magically change the face of racing. Be the change you want to see in our sport.